A fascinating cultural history of fitness, from Greek antiquity to the era of the “big-box gym” and beyond, exploring the ways in which human exercise has changed over time—and what we can learn from our ancestors. We humans have been conditioning our bodies for more than 2,500 years, yet it’s only recently that treadmills and weight machines have become the gold standard of fitness. For all this new technology, are we really healthier, stronger, and more flexible than our ancestors? Where Born to Run began with an aching foot, Lift begins with a broken gym system—one founded on high-tech machinery and isolation techniques that aren’t necessarily as productive as we think. Looking to the past for context, Daniel Kunitz crafts an insightful cultural history of the human drive for exercise, concluding that we need to get back to basics to be truly healthy. Lift takes us on an enlightening tour through time, beginning with the ancient Greeks, who made a cult of the human body—the word gymnasium derives from the Greek word for “naked”—and following Roman legions, medieval knights, Persian pahlevans, and eighteenth-century German gymnasts. Kunitz discovers the seeds of the modern gym in nineteenth-century Paris, where weight lifting machines were first employed, and takes us all the way up to the game-changer: the feminist movement of the 1960s, which popularized aerobics and calisthenics classes. 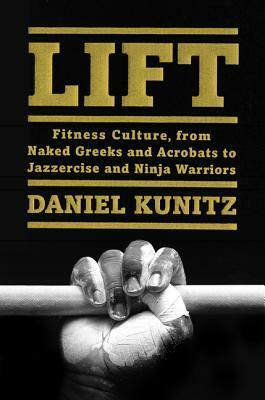 This ignited the first true global fitness revolution, and Kunitz explores how it brought us to where we are today. Once a fast-food inhaler and substance abuser, Kunitz reveals his own decade-long journey to becoming ultra-fit using ancient principals of strengthening and conditioning. With Lift, he argues that, as a culture, we are finally returning to this natural ideal—and that it’s to our great benefit to do so. When I heard about this new release, I was intrigued, especially given my recent interest in going back to school to become a personal trainer. Learning a bit more about the history of exercise and workout trends seemed like a pretty good place to start as I dive into this new career! Kunitz does a good job of not only tracing the general history of exercise, but also discussing the societal factors that helped (or hindered) its growth through the centuries. A significant theme throughout the book is the role that feminism has played in exercise, something that I found quite interesting in an arena that has historically often been male-dominated. However, Kunitz shows that many fitness trends have been driven by either female preferences, or the roles that society has placed upon them. While some of the historical detail got a bit dense at times, overall it was interesting to trace this growth over time. The dryness of the historical detail was broken up by the personal anecdotes of Kunitz himself. Previously inclined to drink and smoke rather than lift and eat smoothies, his transition into the world of exercise was entertaining to read about, and also provides a bit of motivation for those who are looking to get on the fitness bandwagon. That said, I was also a bit turned off by his obvious favoritism towards CrossFit (and its close relatives--acroyoga, Parkour, etc) as the be-all and end-all of workout regimes. While I realize that much of his historical musing leads to the point that this sort of functional, well-rounded fitness program is the "ideal", I have trouble getting behind the idea that one fitness program is inherently "better" than another. I am not at all denying that CrossFit is an excellent workout (and I've actually been very interested in trying it myself for a while now). However, to say that a CrossFitter is "more fit" or in better health than a marathoner, cyclist, or dedicated Jazzerciser feels wrong to me, if only because people have different definitions of what "fitness goals" entail and the paths they would prefer to take to get there. This ended up as a 3-star Goodreads review for me: enlightening on the historical side, fun to read for the personal stories from the author, but occasionally tedious in detail and has a bit of a bias that turned me off. This sounds like a really interesting book! Sounds like he's been drinking the CrossFit Kool-Ade. I work with a CrossFit coach but we don't do CrossFit strictly. She's pretty creative! Please feel free to link up this review with my book club post from Friday! Haha yes, definitely the Kool Aid. I love reading about your CF stuff though, your coach takes such a multifaceted approach! As some who struggles to exercise at all, people who dedicate so much time and effort to an exercise regime are heroes to me. I wish had that kind of motivation!